Hi MYTHIC fans. Guess what? I'm happy to share the cover for MYTHIC #10. The Spring Issue will be coming to you in about a month. 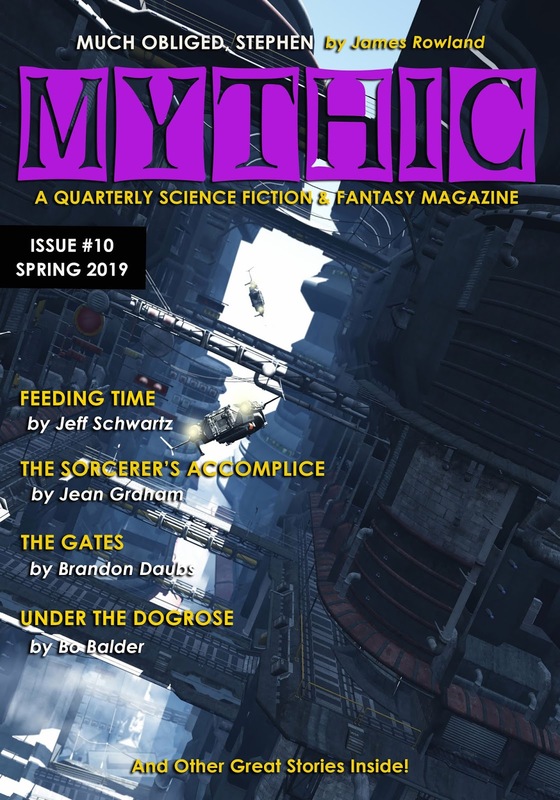 I'd add at this time that one of the perks of being a patron is that you get to see the next cover of MYTHIC: A Quarterly Science Fiction & Fantasy Magazine before everyone else, but it's great news whenever you hear about it. I love finding the right artwork and pairing it with the right stories. One of my favorite parts of editing and publishing a magazine like MYTHIC. If you've snag a copy of MYTHIC and like what you've seen, consider supporting great sci-fi and fantasy fiction; buy a subscription or become a patron through our Patreon page. Attention everyone. 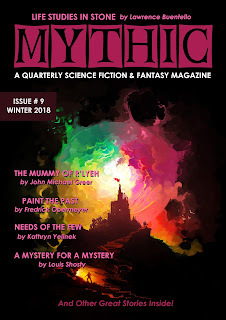 MYTHIC #9 has hit the virtual stands! With the publication of this issue, I'm largely caught up and the scheduling of issue releases will return to normal. I'm working on Issues #10 and #11 even now, to nail down the contents so I can have each issue ready to go so subscriber and patron copies aren't waiting quite so long. Print editions of MYTHIC #9 can be purchased at Amazon and other online retailers. eBook editions are available through Payhip. For those who wish to receive issues of MYTHIC regularly, I've created multiple options. Naturally, you can purchase print and eBook subscriptions here on the website. I call these One-Year Print Direct and One-Year Digital Direct. They are just one-year subscriptions. You get four issues a year in the format of your choice. You would like to offer further support, I also have a Patreon page for MYTHIC. This service allows you to provide monthly support so I can provide better compensation to writers, improve the magazine, and basically keep bringing you new issues. Depending on your membership tier, you get much more than a four-issue subscription. 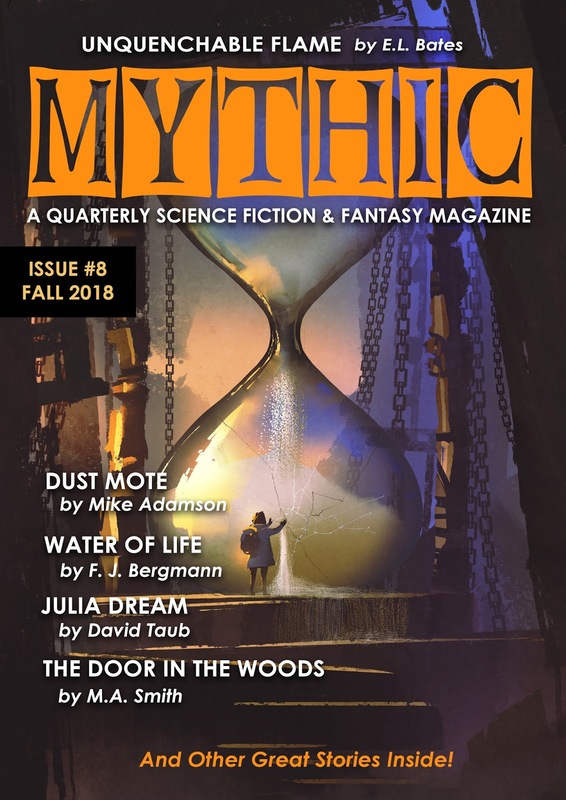 As a patron, you will get access to all current issues of MYTHIC as well as future ones as long as you remain active. There are opportunities for free books, discounts, and other patron-only exclusives. Go check out the options! Hi folks! 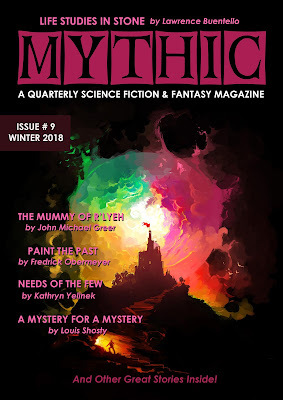 I also wanted to reveal the cover for the soon to be released ninth issue of MYTHIC: A Quarterly Science Fiction & Fantasy Magazine. I will post very soon with the full table of contents. It's going to be a great issue. If you'd like to get each new issue of this quarterly magazine, consider jumping aboard as a patron. Those who subscribe via Patreon get issues as they appear, back issues on occasion, and special discounts and free content not available to anyone else. You can visit our Patreon page right now. Click the button below.